It’s not so unusual to see crowds of people at Ewha, especially the infamous chinese tourists flocking to the main ECC area/main gate with their fancy DSLRs and selfie sticks. Apparently, there’s a superstition that if you take a picture at our school, you’re gonna get paper, have a son, or a boyfriend. I think it’s basically whatever you want your wish to be. But anyway back to business. Queen’s Bagel has been a hot spot, and unless you get there early in the morning, you’re bound to wait in line for this crack bagel. This salmon bagel is the perfect take-out lunch menu. 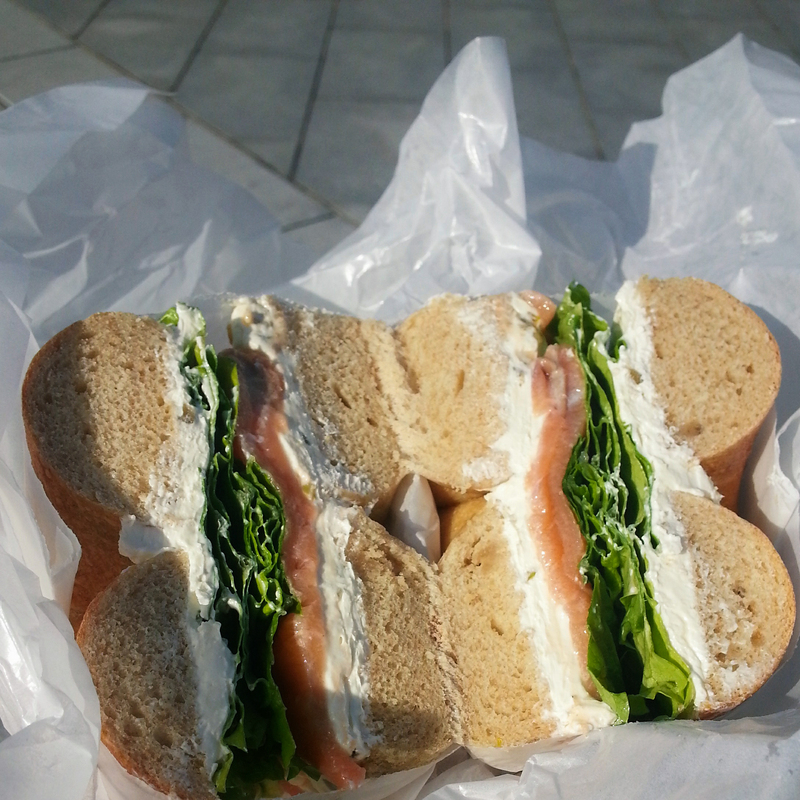 I wouldn’t say it’s my favorite, but they give you a generous amount of cream cheese and salmon. I think the amount of cream cheese that they spread on that bagel is also another main reason why there are so many customers. I used to underestimate the amount, but after downing one bagel, it takes hours for my stomach to go searching for food again. 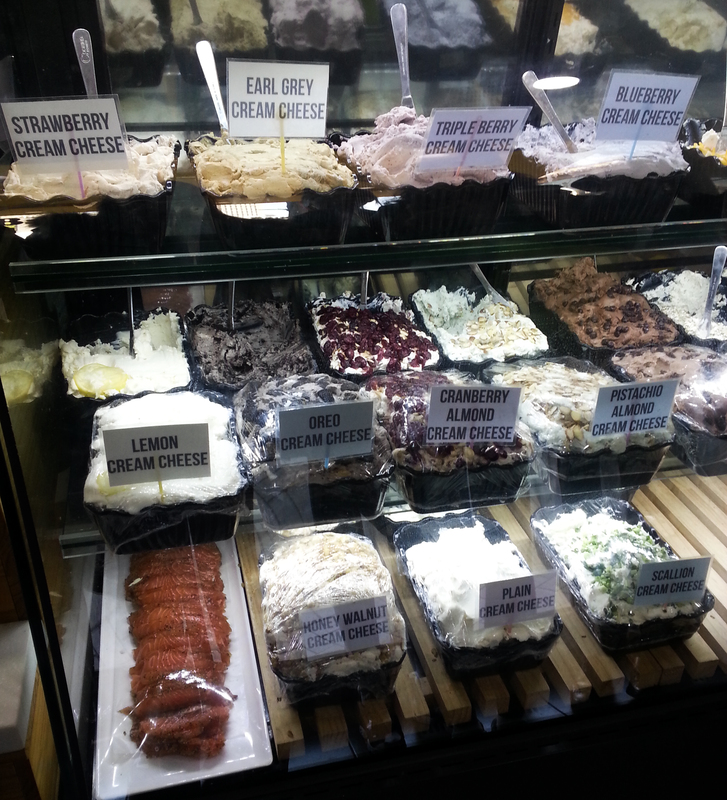 Look at the endless choices of cream cheese… mmhm. 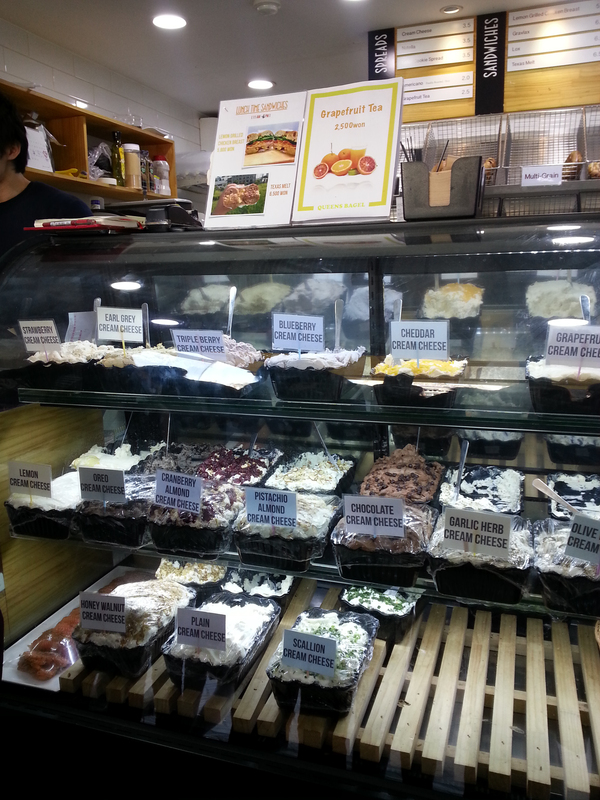 You can ask to try out some of the flavors if you’re unsure about what you want. Just don’t be that person who tries everyyyyy single flavor regardless of the 100 people in line behind. Lately, my personal favorite flavor has been the pistachio almond cream cheese. I’ve always loved my OG pistachio almond flavored ice cream from Baskin Robbins, but who would’ve thought it would taste so good as cream cheese? These are the bagel choices they have! 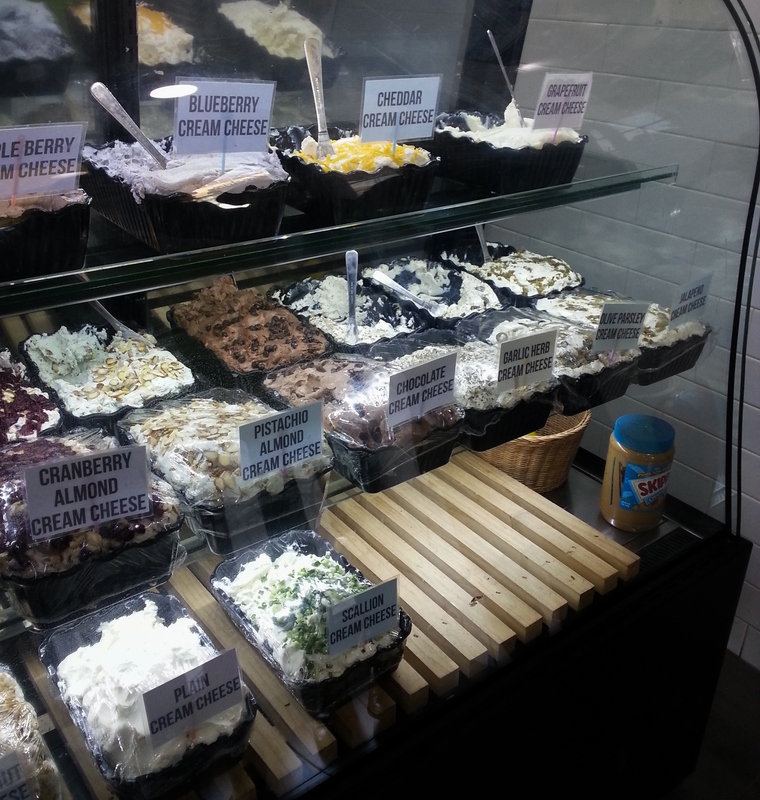 If you’re in doubt about which bagel to match your cream cheese flavor with, or vice versa, the owner will be MORE than willing to help you out. You’ll know what I mean when you encounter him. 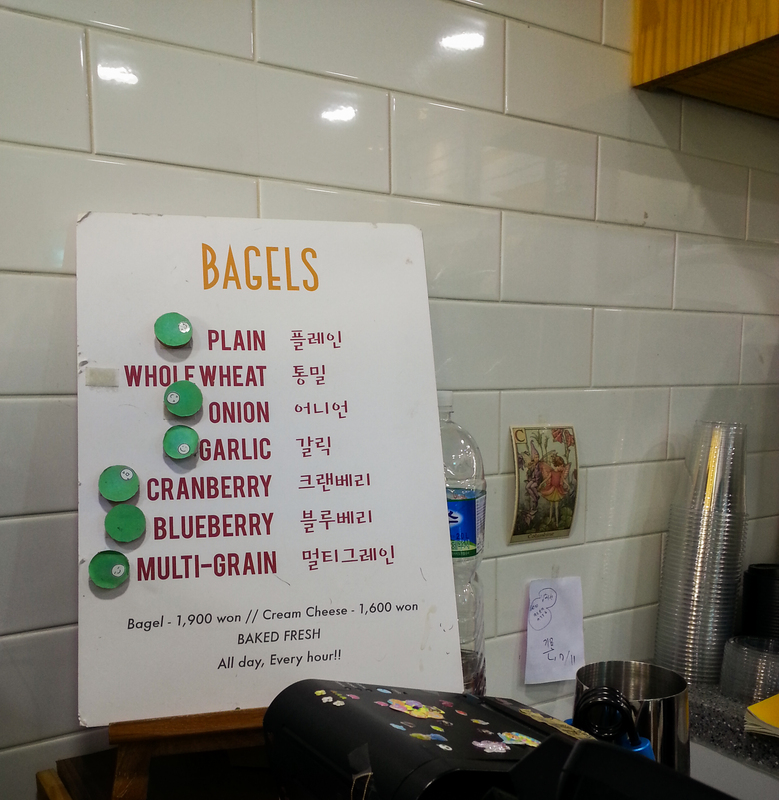 If you want just the bagel or cream cheese, you can just buy it separately- 1900 won for a bagel and 1600 for the cream cheese spread. LOCATION: Right in front of Ewha main gate. Basically, impossible to miss.